Condition is New. A s fi tt ed t o th e MO D Wo lf Land Rover fo r de ep w ad in g. Th is i s th e pr op er g en ui ne k it b y Land Rovern ot s om e af te r ma rk et r ub bi sh. An y qu es ti on s pl ea se a sk. LAND ROVER DEFENDER SNORKEL . 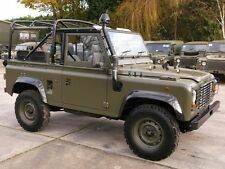 For early 90 / 110 or Defender 200tdi with intake on nearside. Solid used condition with the two brackets to attach to windscreen frame. Bolts to existing hole in nearside wing. Some surface rust that could be sanded off and painted. Good for offroad. The Land Rover Part number is STC50265. Do keep watching for buying opportunities not to be missed. This fits the right-hand side wing(NOT LEFT HAND 200tdi). Excellent quality as they were supplied to UK MOD and are finished in a better than standard coating. A snorkel for a 200 TDi though may fit others. Showing storage rust on the top inlet. FOR DISCOVERY 200TDI INTO 90/110 4 CYLINDER. This kit is made to be used when fitting the Land Rover Discovery 200tdi turbo and manifold into a defender 90/110 4 cylinder with the LT77 gearbox. 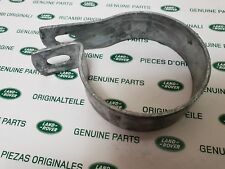 Conversion Front PIpe For fitting a 220 TDI Discovery Engine into a Land rover 90 or 110. 2.5 L Td5 I5 (diesel). Raised Air Flow Intake Induction System Snorkel Kit Land Rover Discovery 2. 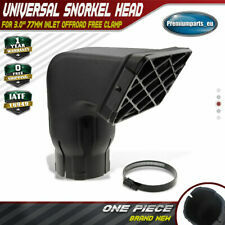 1 set of Raised Air Intake Induction System Snorkel Kit. This snorkel system relocates your engine's air intake point from relatively low and vulnerable position under the bonnet/hood to a higher and safer location where a constant source of cool, clean, dry air is available. LAND ROVER DISCOVERY 200TDI CONVERSION INTO DEFENDER 90/110. SPECIALLY MADE BOTTOM RADIATOR HOSE MATES TO 200TDI RADIATOR. This hose is manufactured to fit the 200 Tdi radiator hose with the Discovery 200 Tdi engine in a Defender 90 or 110 4 cylinders with the LT77 gearbox. Fitting this tube also removes the common issue of the plastic intake cracking at the corrogated section. 2.7 L AJD V6-T (diesel) /TDV6 SE. 2.7 L AJD V6-T (diesel)TDV6. 3.0 L AJD V6-T (diesel)TDV6. For 2004-2009 Land Rover Discovery 3 MK III (L319) LR3 For 2009-2016 Land Rover Discovery 4 MK IV (L319) LR4. 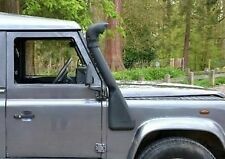 LAND ROVER DISCOVERY 2 TD5 RAISED AIR INTAKE SNORKEL OFF ROAD. USED SNORKEL OFF LANDROVER DISCOVERY 2 USED ABIT SCRATCHED BUT STILL OK NEED NEW TOP MESH SE PICS. THE METAL PEICE IS THERE ITS JUST SILCONED TO TE SNORKEL. NEEDS A CLEAN BREAKING WHOKE CAR ALL OARTS AVAILABLE MESSAGE FOR INFO. 1 x ESR2102. Good quality Bearmach parts supplied. 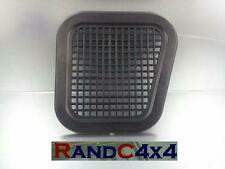 Air Filter Housing for Land Rover Defender 300Tdi vehicles from approx 1994-1998. Suitable for 90/110 &130. Manufacturer Part Number DA3025. MPN DA3025. Safari snorkels are manufactured to the highest standards in durable, UV stable, cross linked polyethylene material, using stainless steel hardware where appropriate. Discovery 3 & 4 - TDV6 - Safari Snorkel. Safari Snorkels are manufactured to the highest standards in durable, UV stable, cross linked polyethylene material, using stainless steel hardware where appropriate. SPCK224A 200Tdi Conversion Air Filter Kit 90 110. Conversion Parts Conversion Accessories. This is an Air Filter Kit to connect up the air filter system when a Land Rover Discovery 200 Tdi engine is being fitted into a Land Rover 90 or 110. ALL MODELS INCLUDING TD5 AND V8. SAFARI STYLE RAISED AIR INTAKE / SNORKEL. LAND ROVER DISCOVERY 2. This kit is made to be used when fitting the Land Rover Discovery200tdi engine with the Discovery Radiator and intercooler assembly into a defender 90/110 4 cylinders with the LT77 gearbox. Intercooler Pipe KIt For fitting a 220 TDI Discovery Engine into a Landrover 90 or 110. TF159 RAISED AIR INTAKE FITS THE RANGE ROVER P38 ALL MODELS. Raised air intake / snorkel for the Range Rover P38 all models. Manufacturers part numbers are used for reference purposes only. We are then able to sort out any problems for you quickly with the minimum of inconvenience. There are many how too guides on youtube on how to fit this snorkel. Discovery 1 models with Engines 300 TDI and V8 Petrol WITH ABS. OR Northern Ireland, Southern Ireland, Scottish Isles, Channel Isles, All other isles off the mainland. This will fit both Td5 and V8 models. Genuine Safari Snorkel to fit Land Rover Discovery 2. Safari snorkels are made to the highest standards in durable, UV stable, cross linked polyethylene material, using stainless steel hardware where appropriate. Part Number: TF159. Range Rover P38 Raised Air Intake / Snorkel. Suitable for all P38 models. Our snorkels will ensure that clean dry air is always available, regardless of the conditions. Part numbers are used for identification purposes only and do not imply or indicate the identity of a manufacturer. PARTS NUMBER:BA 2164. LAND ROVER DEFENDER 110. HIGH QUALITY AIR SUSPENSION AID FOR DEFENDER 110. (2 kits required). This kit is to repair the drain spouts that normally brake off due to getting brittle and are made from plastic. This then causes water to leak into the headlining and then run down into your car. Pictures are for reference only and specifications may alter without notice. Channel Islands; Northern Ireland (BT); Isle of Man (IM); Isle of Wight; Isles of Scilly. Part numbers are used for identification purposes only and do not imply or indicate the identity of a manufacturer. Raised Air Flow Intake Induction System Snorkel Kit Land Rover Defender 300Tdi Td5. 2.5 L Td5 turbodiesel I5. 1 set of Raised Air Intake Induction System Snorkel Kit. This snorkel system relocates your engine's air intake point from relatively low and vulnerable position under the bonnet/hood to a higher and safer location where a constant source of cool, clean, dry air is available. MANTEC RAISED AIR INTAKE LOWER SECTION. 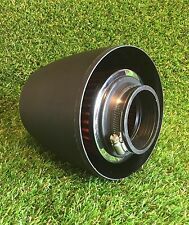 FITS STRAIGHT TO THE AIR INTAKE APERATURE ON THE LHF WING OF THE LAND ROVER DEFENDER 200 TDI. LAND ROVER DISCOVERY 200TDI INTO DEFENDER 90/110 INTERCOOLER HOSE KIT 1985-1990. This kit is made to be used when fitting the Land Rover Discovery 200tdi engine with the Discovery Radiator and intercooler assembly into a defender 90/110 4 cylinders with the LT77 gearbox. 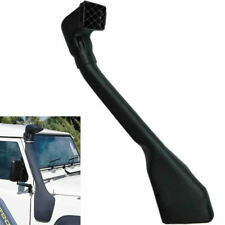 This Tyrex plastic snorkel is designed for Land Rover Discovery 300TDI. For all Discovery 1 300tdi without ABS. These snorkels can be fitted without modifications to your vehicle and allow effective air flow for maximum engine performance. Manufacturer Part Number ESR415. Reference OE/OEM Number ESR415. MPN ESR415. Independant Land Rover Specialist Since 1974. Prop shafts. Range Rover Evoque. Range Rover Classic. Range Rover Sport. Directly replaces the air filter in your airbox. 30% more airflow over a standard paper air filter. Easy cleaning, no dirt caught like with V shaped filter grooves. PARTS NUMBER:BA 2163. LAND ROVER DEFENDER 90. HIGH QUALITY AIR SUSPENSION AID FOR DEFENDER 90. SPCK224CL Conversion Intercooler Kit LH Drive 200Tdi Discovery 90 110. This conversion kit is for fitting the Discovery 200Tdi engine into a Left-Hand driveLAND ROVER 90 /110. SPCK224CL Conversion Intercooler Kit LH Drive 200Tdi Discovery 90 110.
this is the lower alloy pipe with the correct hoses and clamps .price per 1 unit selling 3 can co.bine p/p .